Greensboro, N.C., has been awarded a $4,290,944 modifica- tion to a previously awarded cost-plus-incentive-fee / cost-plus- fixed-fee contract for oceano- graphic systems. The Naval Elec- tronic Systems Command, Wash- ington, D.C., is the contracting activity (N00039-82-C-0443). Brent A. Steinecker has been appointed corporate vice presi- dent of Crowley Maritime Corpo- ration of San Francisco, Calif., according to a recent announce- ment by Leo L. Collar, CMC ex- ecutive vice president, opera- tions. Crowley's California Division. He is based at corporate headquar- ters in San Francisco. California Division. Before his association with CMC, he held successive managerial posts in industrial relations, marketing, and finance for a large indus- trial firm. Company, Tampa, Fla., it was announced recently. 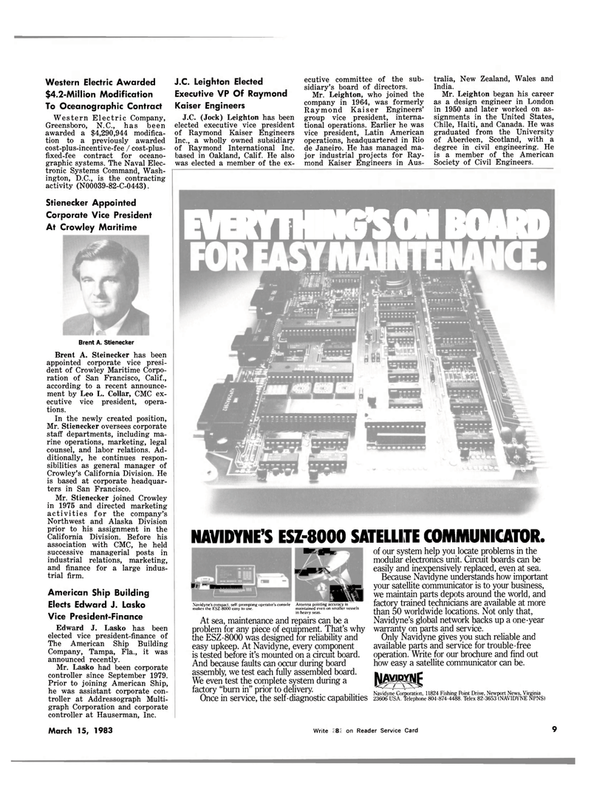 Mr. Lasko had been corporate controller since September 1979. Prior to joining American Ship, he was assistant corporate con- troller at Addressograph Multi- graph Corporation and corporate controller at Hauserman, Inc.
Inc., a wholly owned subsidiary of Raymond International Inc. based in Oakland, Calif. He also was elected a member of the ex- ecutive committee of the sub- sidiary's board of directors. Navidyne's compact, self-prompting operator's console Antenna pointing accuracy is makes the ESZ-8000 easy to use. maintained even on smaller vessels in heavy seas. At sea, maintenance and repairs can be a problem for any piece of equipment. That's why the ESZ-8000 was designed for reliability and easy upkeep. At Navidyne, every component is tested before it's mounted on a circuit board. And because faults can occur during board assembly, we test each fully assembled board. We even test the complete system during a factory "burn in" prior to delivery. Once in service, the self-diagnostic capabilities of our system help you locate problems in the modular electronics unit. Circuit boards can be easily and inexpensively replaced, even at sea. Navidyne's global network backs up a one-year warranty on parts and service.